Heritage diversity and historic preservation: We need your help! The History Colorado Office of Archaeology and Historic Preservation (OAHP) needs your help identifying places important to women’s history, African-American, Asian-American and Pacific Islander, LGBTQ, Latino, and urban Native American communities. In commemoration of the 50th anniversary of the National Historic Preservation Act, OAHP seeks to partner with our fellow Coloradans to document and educate about our shared heritage diversity, as well as to provide information about historic preservation incentives. 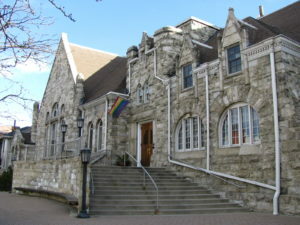 First Unitarian Church of Denver. You are the key to this effort. Do you know of any historic or cultural resources that need recognition or saving? Use this link to tell us about the places in your community that represent stories of Colorado minority experience—places that might be centers of social activism, cultural sites, or simply gathering places. You can also follow along with or contribute to the heritage diversity Historypin page. Help us document and preserve those places. In so doing, you will be helping us preserve Colorado's heritage diversity story.